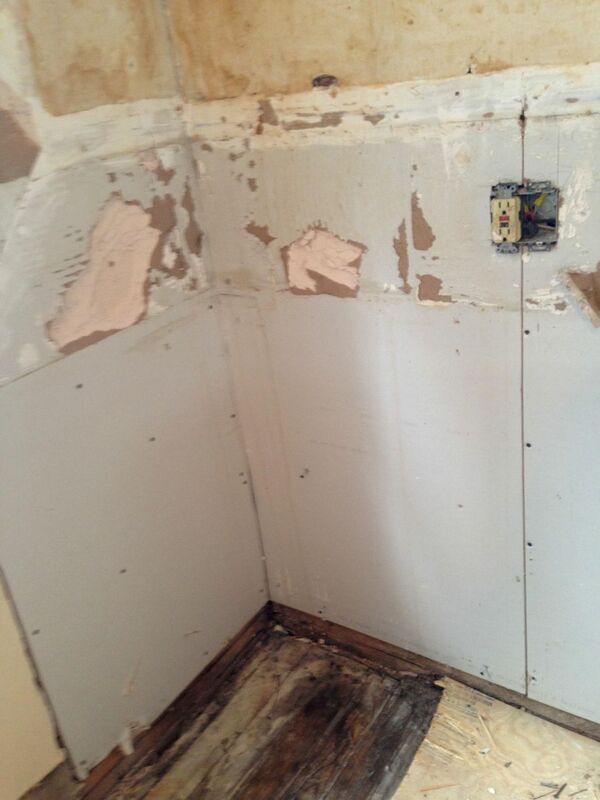 So…I removed the circa-1950 soffit (previous post), revealing 1930s wallpaper. I love the wallpaper, and will somehow, somehow figure out a way to keep it. Under the soffit was a niche, tiled with more Home Depot 12×12 ceramic tiles. This was just too weird. It had to go. My plan was to stop at this point. I mean, the kitchen was installed just before I purchased the Cross properties, and had never been used. It seemed reckless to just tear it ALL out. But…see that upper cabinet to the left? I knew there was a window lurking behind it. And, to me, covering up windows, covering up LIGHT, is a mortal sin. So I thought: I will just remove the upper cabinets covering the window. Yea, just one more small change. 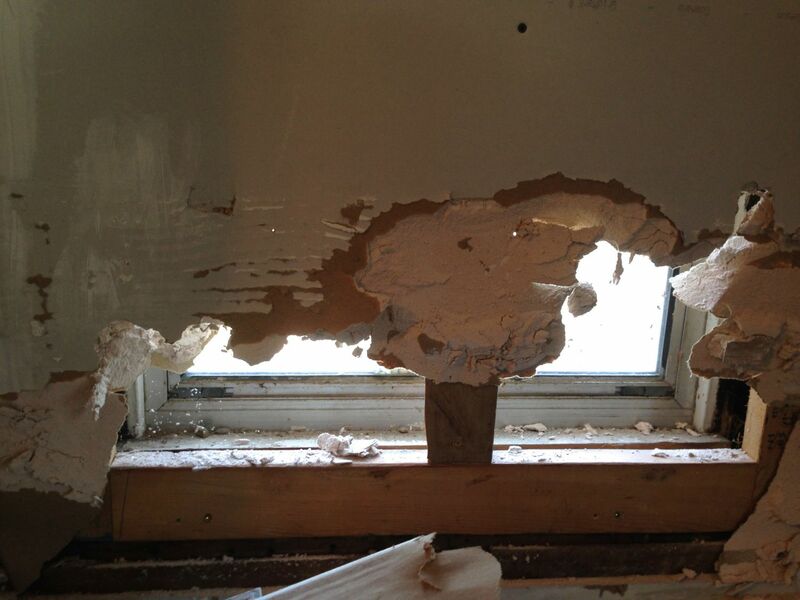 After the upper cabinet was removed, I found new sheetrock, and punched a hole in it. And God rewarded me…with LIGHT! Hallelugiah! LIGHT!!!!!!!! The north window returns!!!!! Scarily, there was no insulation behind the sheetrock covering up the north window. I was also amazed at how much brighter the room instantly became. And, the north window looks right at the fabulous Cross House! Hey, what a view! 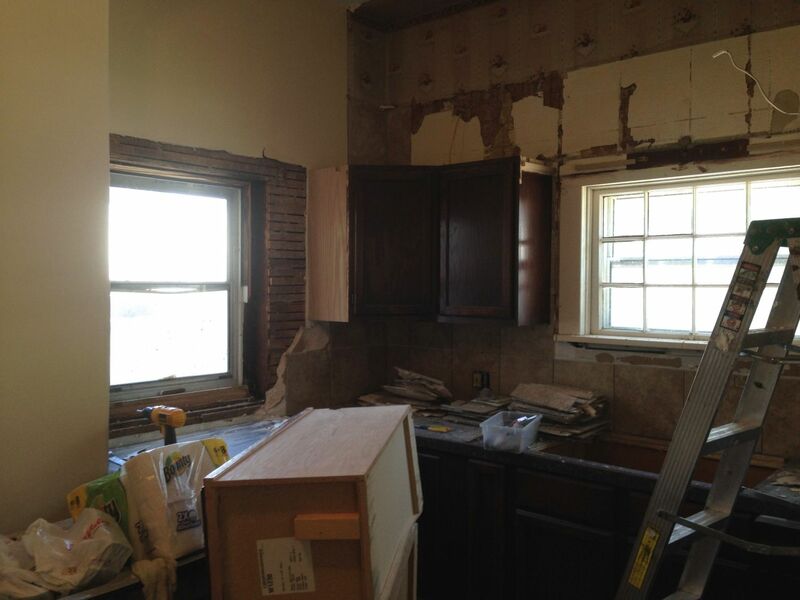 Then I thought: Gee, what would the kitchen look like with ALL the dark Home Depot upper cabinets removed? Curiosity is a powerful thing. I must be part feline. And this is the answer to the question above. Ok, ok, I now have a terrible mess to repair. Or…do I? The terrible mess was not a hopelessly decayed wall but layers of paint upon layers of wallpaper. It all came off effortlessly (right side) revealing original mint 1921 plaster. Whoee! My plan at this point was to keep everything just below the center windowsill. I could live with Home Depot below as long as there was Cool above. 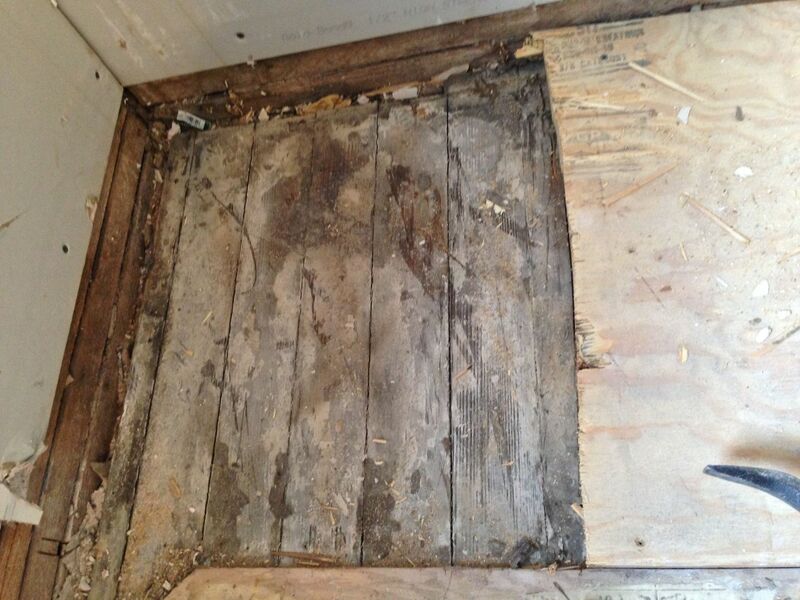 That curiosity thing attacked me again as a thought gnawed on my brain: Is the original 1921 wood floor still present under the new 12×12 Home Depot ceramic tiles???????? The thought GNAWED over a span of several days. 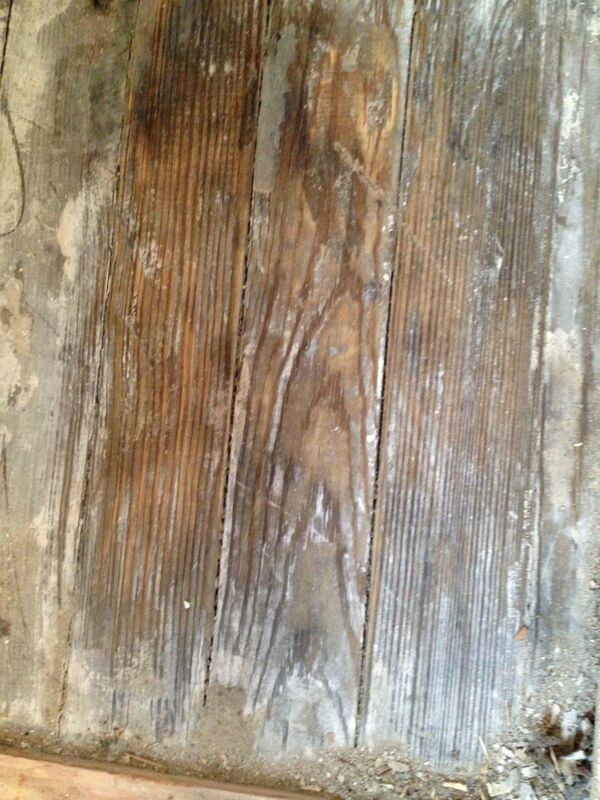 …the original 1921 pine floor!!!!!!!! OMG! I am freakin’ out!!!!!!!!!!!! There it is! There it is! IT EXISTS STILL! A quick scrape revealed beauty. 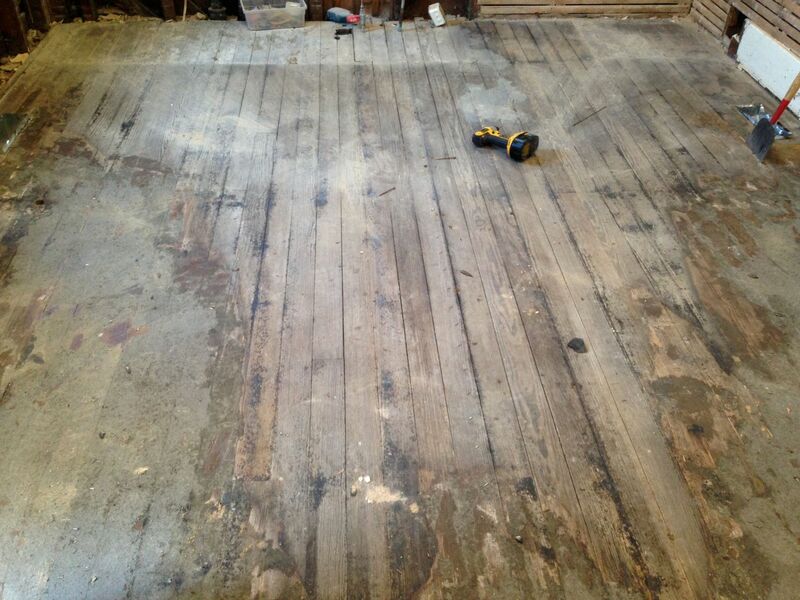 OK, I know it don’t look like much now, but, trust me, this floor could be GORGEOUS if refinished! Gorgeous, dahlin’! Just ask Nicole Curtis! 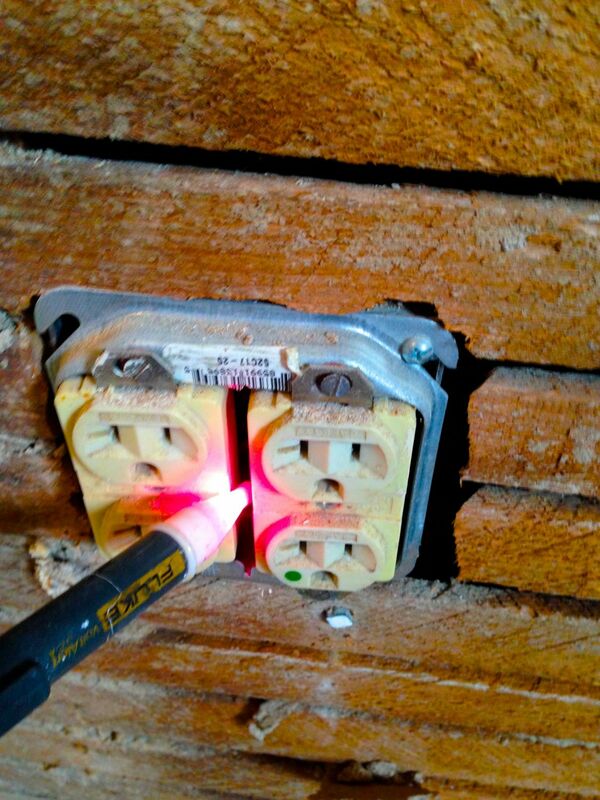 A live electrical outlet which has been buried behind a base cabinet. There were other scary electrical issues revealed, too. And an A/C duct had been buried under a base cabinet, still blowing cool air. 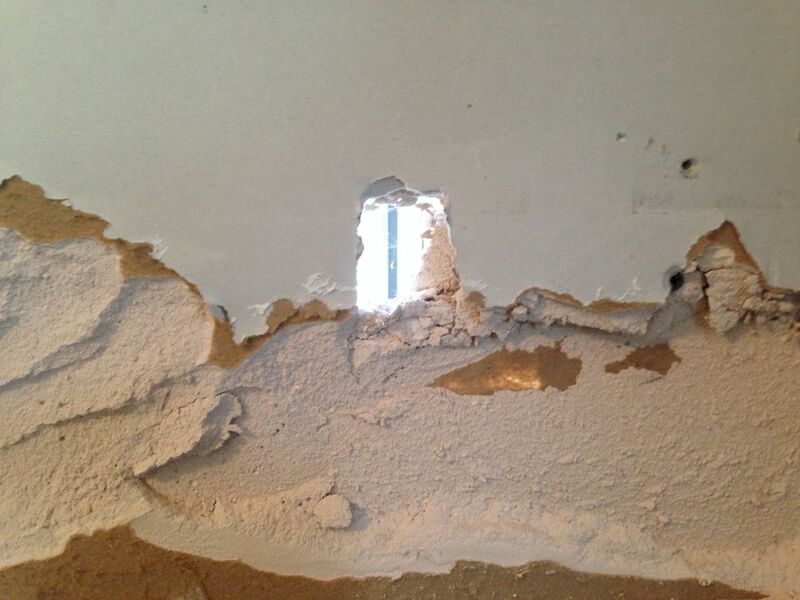 So, the sheetrock had to go to ascertain just WHAT was going on behind it. 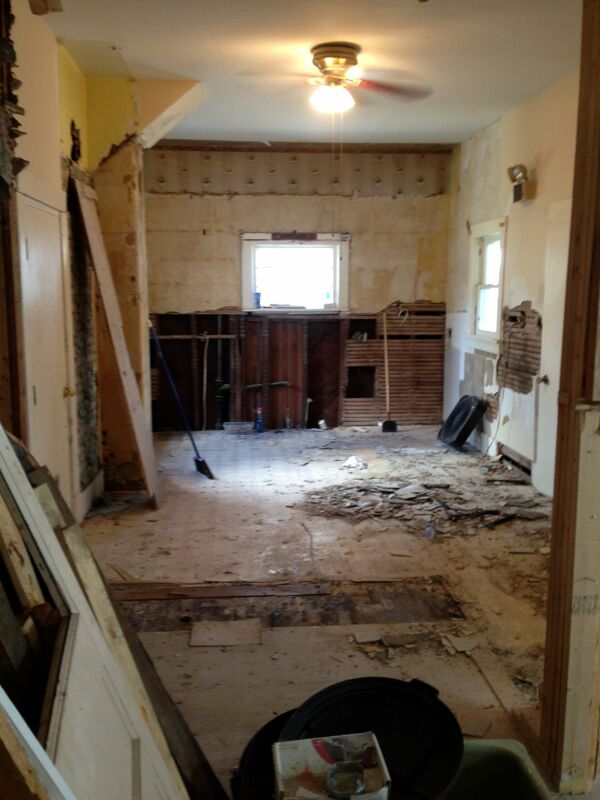 Sheetrock gone. 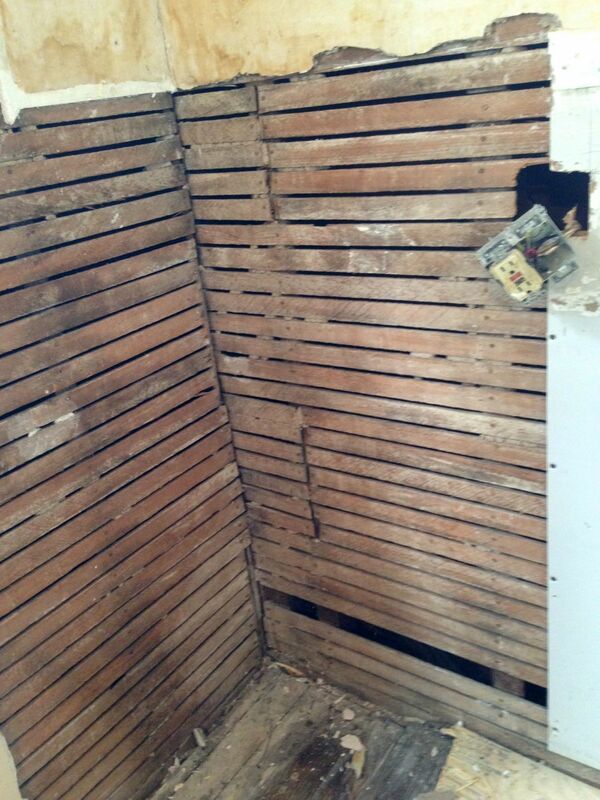 1921 lath exposed. Neat! 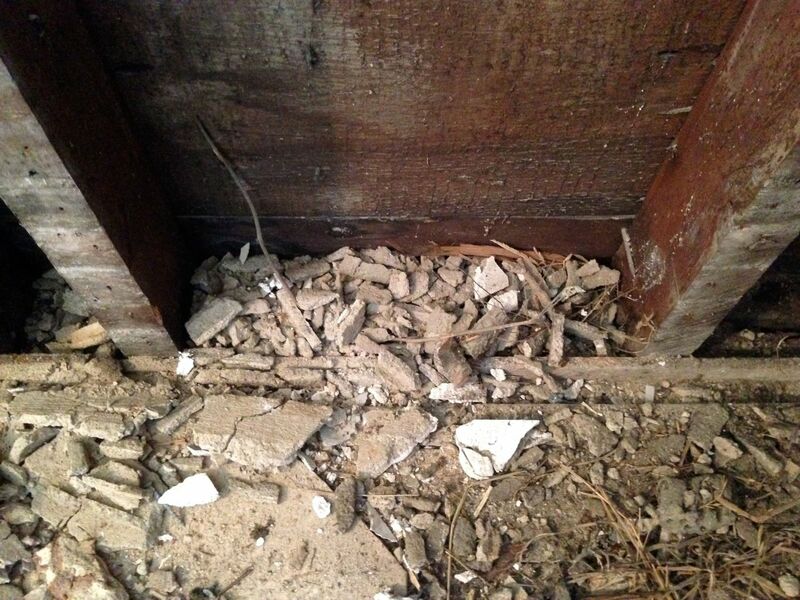 But no insulation is behind the lath. Not neat. So off with the lath. But wait, what is that behind the lath? Zounds! 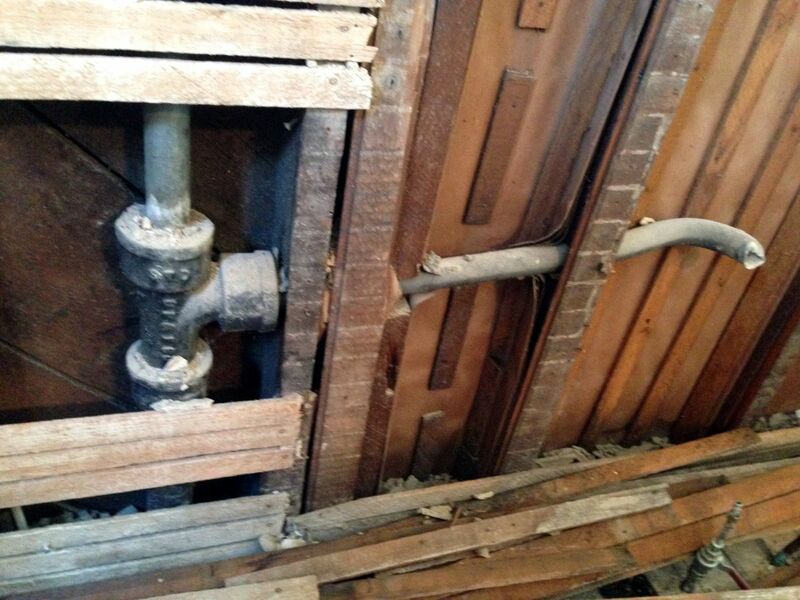 It is the 1921 sink drain and vent stack!!!!! 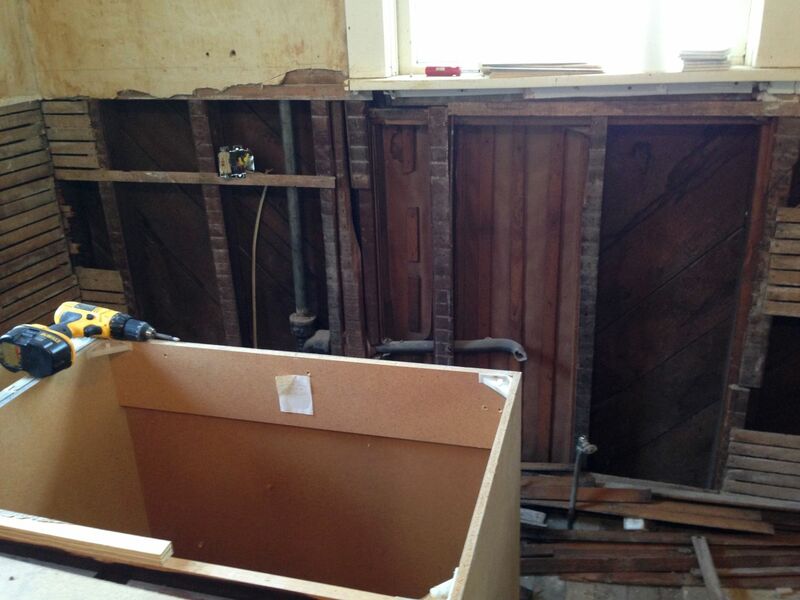 The original 1921 sink would have certainly looked just like this. I would kill for such a sink, KILL, but I have to finish the kitchen on a $1.98 budget as I am still paying off the titanic-sized repair bill to the radiator system in the Cross House. 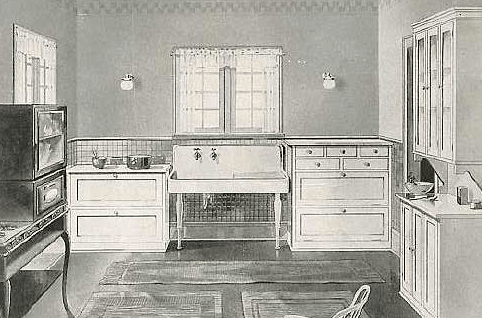 Oddly, this image is a weirdly accurate picture of what the 1921 kitchen would have likely looked like. 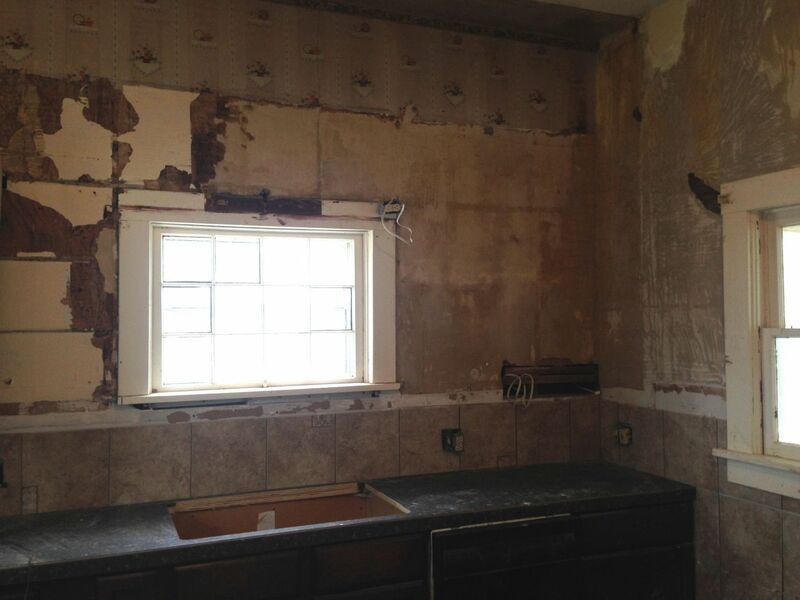 The carriage house kitchen has a center window, which had the sink under. There is a window to the north (left in the above image) and a matching window directly to the south (where the door is in the image). The 1921 stove would have been exactly where the image stove is. 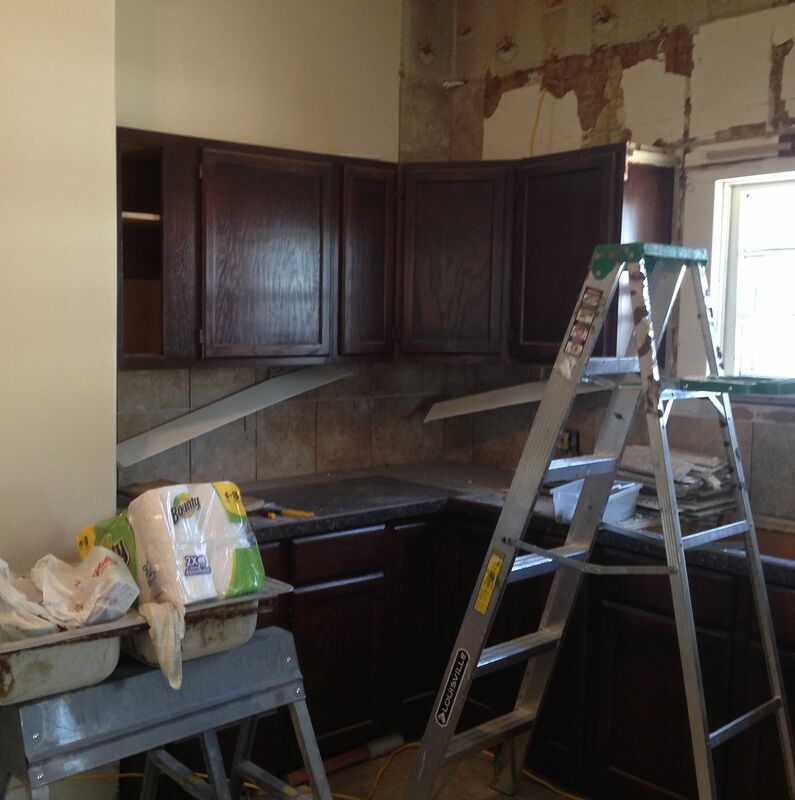 The cabinets in the 1921 kitchen would have, pretty much, looked just as you see in the image. Why, I might even know where the tall cabinet went. This is a sight known to all old house renovators. And there is no way that I could insulate and install new sheetrock with this mess remaining in place. An object of my abject adoration? A good shop vac. Well, you knew it was coming to this: hardly a vestige remaining of the Home Depot, never-used kitchen. 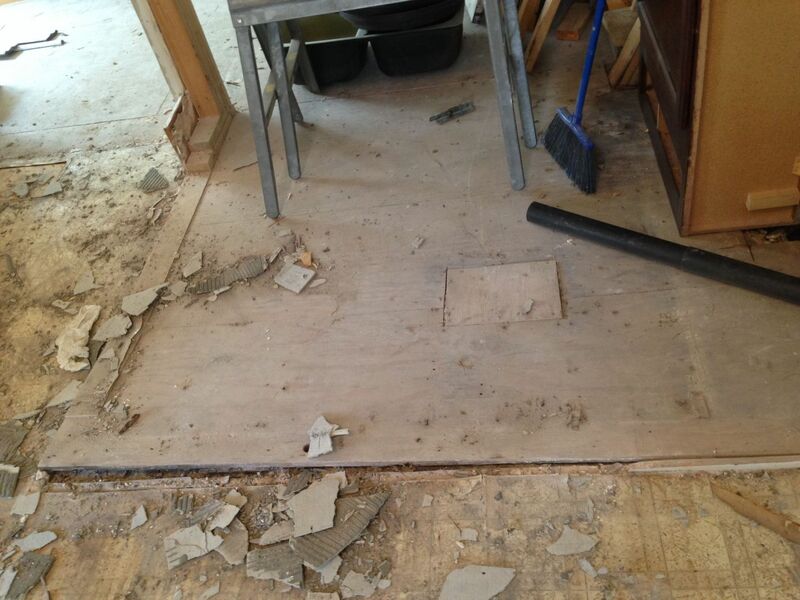 Save the 12×12 ceramic tile floor. Which I was determined to keep, as a last stand of rationality. One night, while I slept, pixies crept into the carriage house, and, with miniature pry bars, removed all the 12×12 ceramic Home Depot tiles. What else could explain their mysterious disappearance? 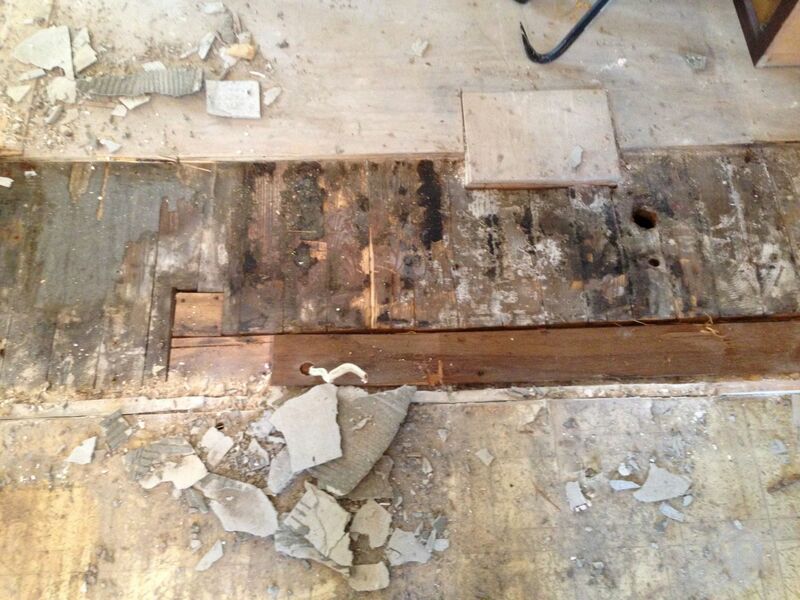 …covering up the original 1921 pine floor. In great shape. I cannot express my absolute joy over revealing the floor after decades and decades. WHOEE! ZOUNDS! GEEZ! YIPPEE! Note: The 1921 floor was later covered with 1) Art Deco linoleum, 2) circa-1950 linoleum, 3) plywood, 4) 1970s vinyl, 5) backer board, and 6) 12×12 ceramic tiles. In the corner of the kitchen, a 1980s handicapped-accessible bathroom was created, protruding into the dining room. This horror was demolished last year. 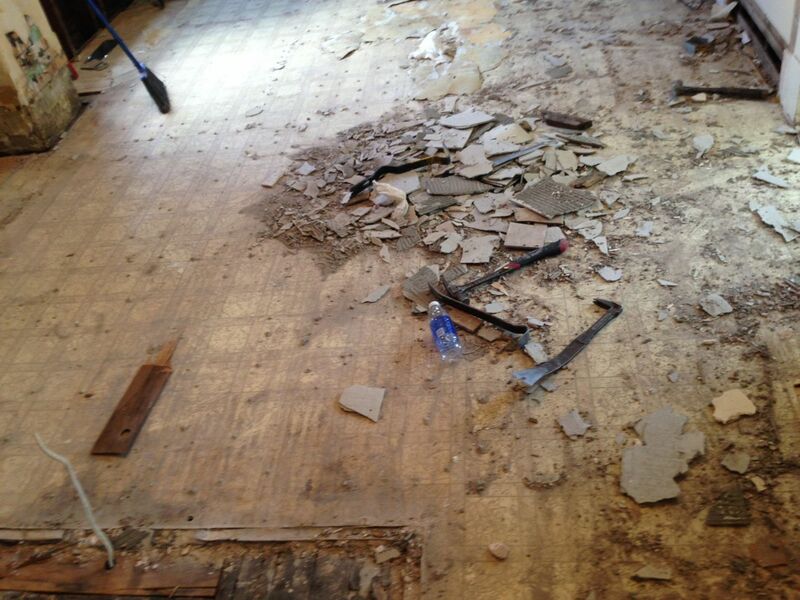 But under was, I feared, no original flooring. Or so I assumed. 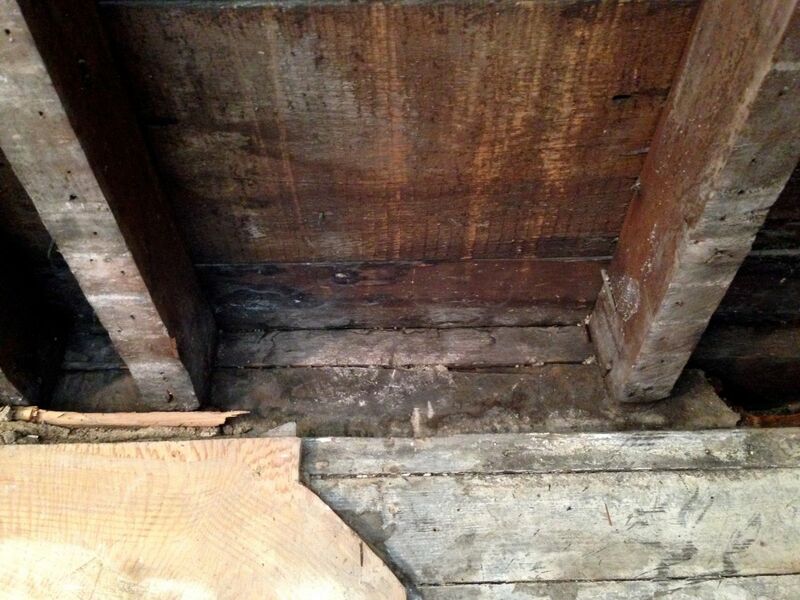 I love being proved wrong in such an instance, as the 1921 pine floor is largely intact under the now-vanished bathroom. WHOEE!!!! 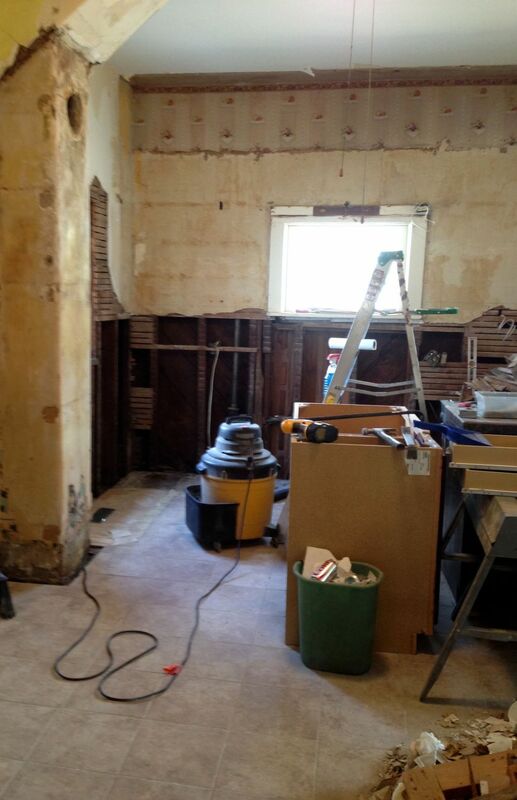 It now seems that the bathroom had originally been, in part, a pantry. Not a vestige remains of the R.I.P. Home Depot never-used kitchen. 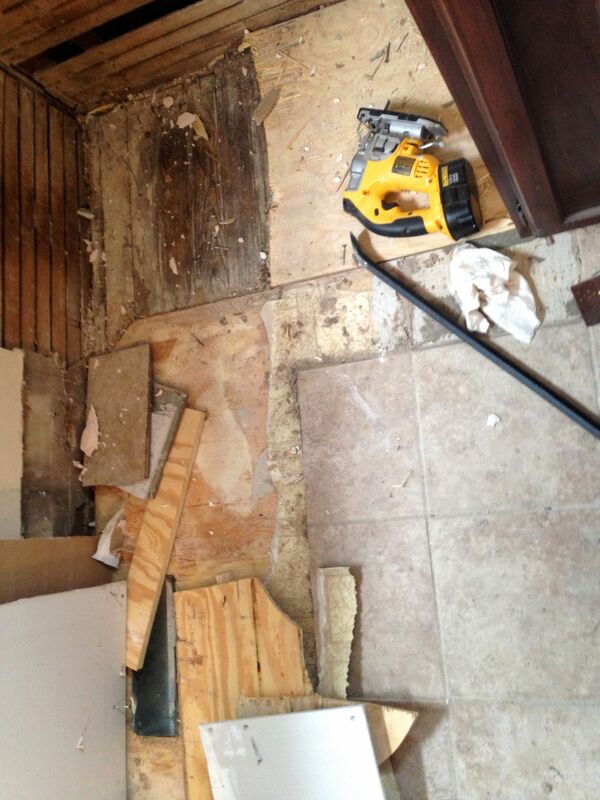 This was not the plan when I started on the kitchen two weeks ago. The current plan (Disclaimer: all plans subject to change) is to at least reuse the base cabinets. With green glass antique knobs? My problem with the kitchen is that the carriage house is a very cool old building, with a way cool history, but it had an anonymous kitchen from Home Depot. This really bothered me, for I knew I could create a FABULOUS kitchen. And for not much money even. Really. 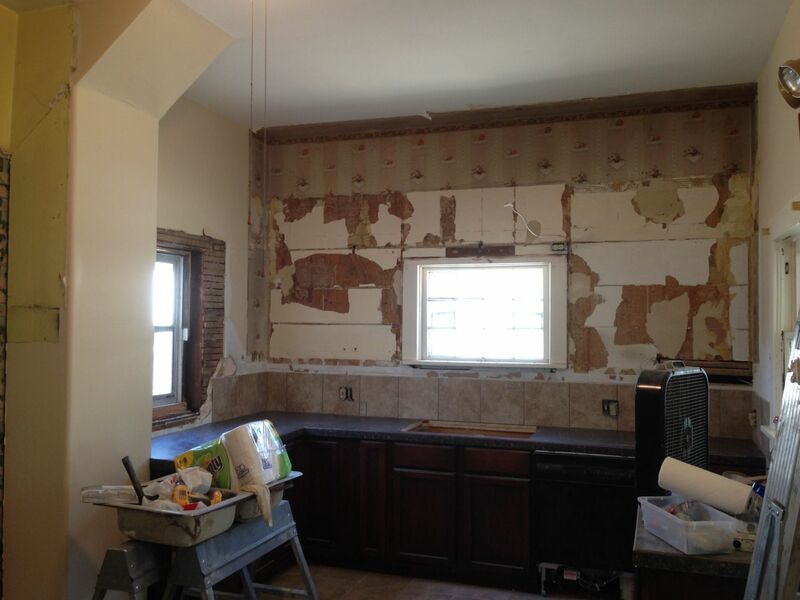 I could have simply spent the time and energy finishing the almost completed Home Depot kitchen. But I also knew if I did, I would not likely tear it out later. I would learn to live with it. And this I could not live with. You are so right! I can now hear the same screams!!!!!!!!! I love, love, this post. I can’t wait for the next chapter. Can’t imagine covering a window. Well done. Renovation gods have been appeased. Prepare for a monetary windfall. Oh my word!!! It is amazing what you found once you started peeling back layers. I have been reading non stop for three days taking your journey, albeit a bit late. Like a great book, I just can’t put it down. I have a 3 room old Victorian my mother used as an antique shop, no closets, no bathroom, a leaky roof, bad electrical, and so out of level that my good old southern cornbread gravitated to one corner of the pan in the old 40’s stove. I have been working on this place for almost twenty years and spent 3 times what my mother paid for it. It cannot even touch the hem of the garment of Cross House, but it is my old house. So since I will never have a grand lady like yours, I content myself to live vicariously through yours! Onward I go, waiting for the new “eeks” and “zounds”. 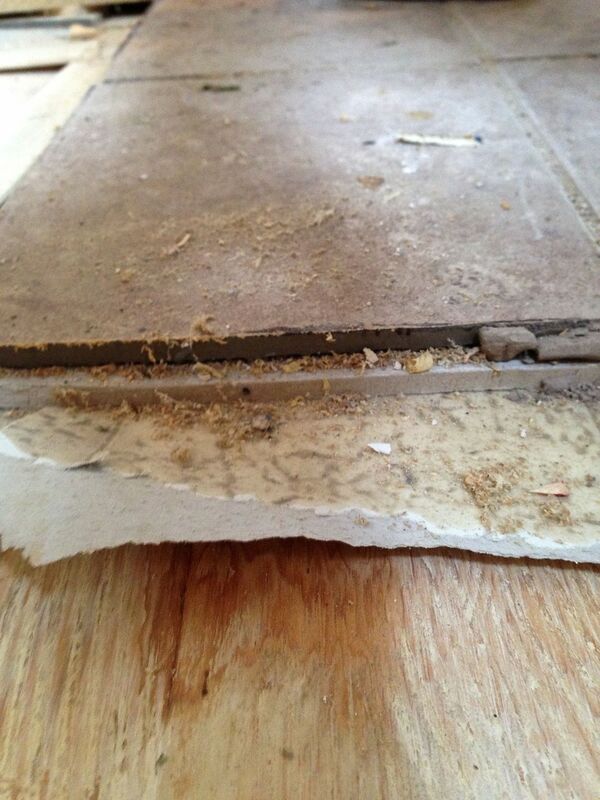 The uncovering of layers of flooring sounds akin to an archeological dig.